We can also demonstrate using a computer software programme the appearance of your finished lenses in your individual prescription once the frame has been chosen and a few measurements have been taken. This is particularly useful for higher optical prescriptions where thinner lenses would be advised to reduce the thickness and weight. 1: Varifocal Lenses – (the modern alternative to bifocal lenses without the line). They are normally advised to people over the age of 40, normally when separate distance and near prescriptions are required giving you clear vision at all distances. 2: High Index Lenses – In the past, some patients who have had a more complex prescription have had to put up with thicker and heavier lenses in their spectacles. Thankfully today’s advances means the super thin and light weight Hi-index lenses now make them look great and feel more comfortable. 3: Transitions – They are fast acting variable tinted lenses which darken in sunlight. Indoors they are clear, but outside they rapidly darken effectively changing them into conventional sunglasses. Transitions are available in grey, brown, and with some prescriptions, green tints. 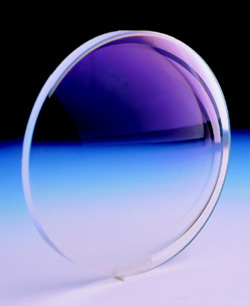 4: Lens Coatings – They are advised to reduce annoying reflections, improve the appearance of your spectacles and most importantly to enhance you vision. More recent advances in technology now means you can get the added benefit of them being anti-scratch, anti-dust, UV protected (We offer Crizal Forte UV with a 2 year warranty), repellent to water, grease and dirt making them more durable and a lot easier to clean.